Dramatically reduce cycle times from 2-axis turning by moving up to these true 4-axis, heavy-duty lathes that are ideal for large diameter, balanced and pinch turning. Two turrets, two independent saddles, 22 tool stations, four power ranges, large hardened box guide ways, a live quill tailstock and the easy-to-use THINC-OSP control system give you unrivaled versatility and reliability. Adding the optional milling function for milling and drilling in the upper turret enables secondary machining with one work holding to maximize efficiency. 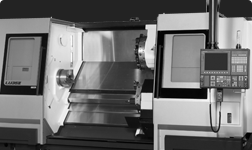 The many standard or optional features that let you match the LU to your unique requirements include four-axis turning with live tooling, live tool turret, geared headstock, c-axis, A2-8, A2-11, A2-15 or A2-20 spindle noses, milling function, Thermo Friendly Concept, Machining Navi and Collision Avoidance System. Flexible and precise 4-axis CNC turning center. 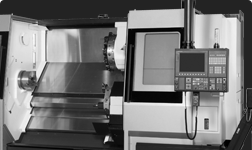 Efficient and easy-to-use 4-axis turning center.